Well… I had in my head that I was 2 months behind on Emily Grace posts, but it turns out… I have done one total, and she is 5 months old. Poor second child. Emily Grace, this does not mean we love you any less. It just means life is C-RAZY. So here’s a quick update, 4 months later. Emily is fantastic. Emily has been sleeping through the night for months now, which definitely makes the husband and I feel much more like real humans. She is a very chill, relaxed child, who loves to chatter at whoever will listen. She loves to smile at you, and she has the cutest most kissable cheeks. But, you know, I might (maybe just maybe) be biased. Taylor is OBSESSED. 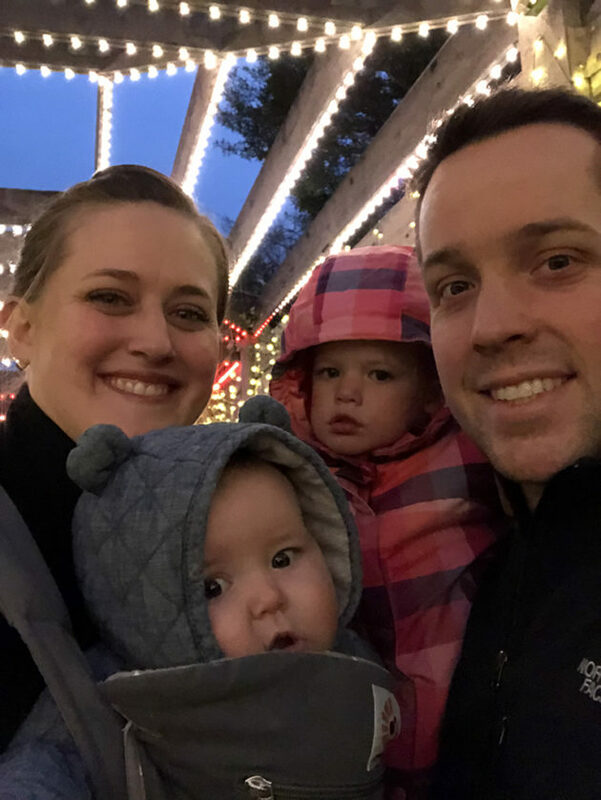 I expected (especially since we were smack dab in the middle of the “MINE” phase when Emily Grace was born, that we would have some jealousy issues and resentment. I’ve heard many a funny story about older siblings wanting to ‘return’ their younger siblings. And so far, there have been none. In fact, quite humorously, if you tell Taylor that she is my Emily Grace, Taylor will respond with an emphatic… “NO, MY Emily Grace”. And speaking of the Emily Grace instead of Emily, we fluctuate back and forth, but Taylor is the one who started calling her Emily Grace with regularity. 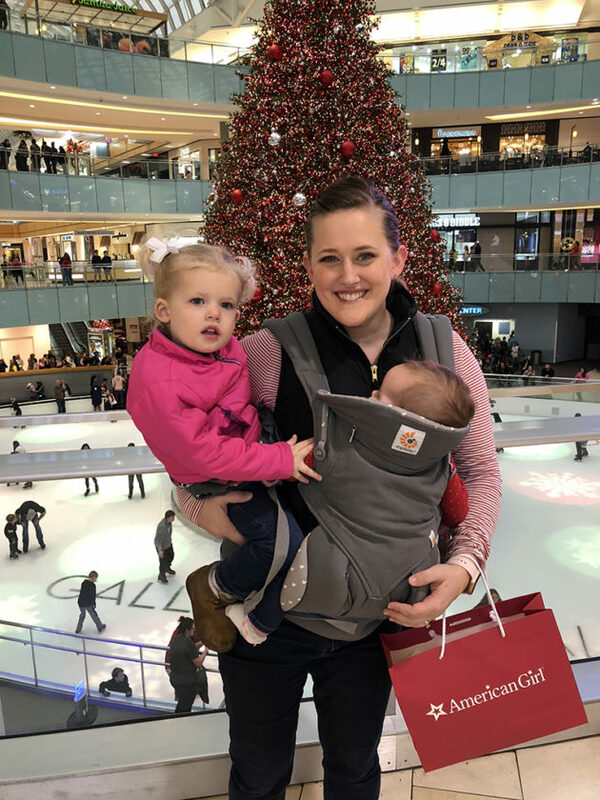 Apparently any time a child cried at school, Taylor would perk up and say “Oh, Emily Grace is crying”, even when it wasn’t, in fact, Emily Grace. 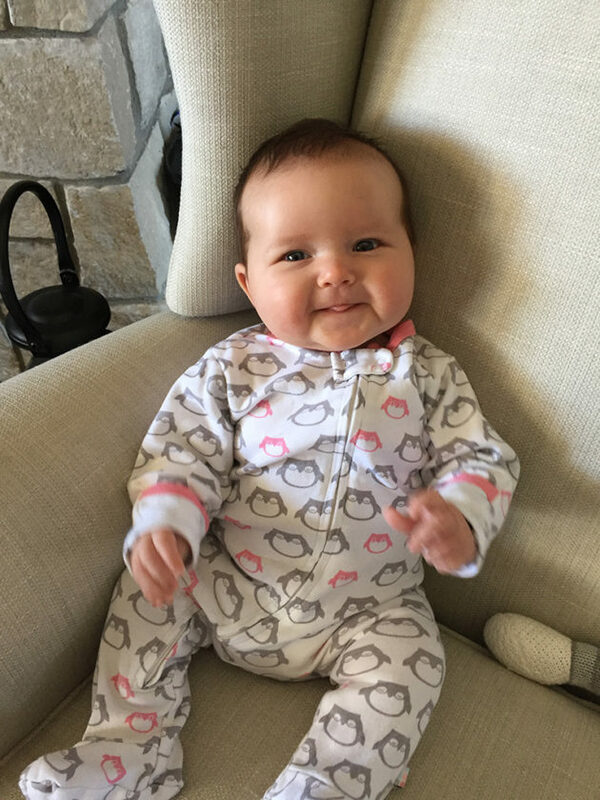 We are starting to give her solid foods, although with those adorable cheeks and chunky thighs, she is definitely NOT starving, she is unsure whether she likes this whole REAL FOOD thing. We’ve been through our first Halloween, Thanksgiving and Christmas as a family of four, and while having 2 kids under three (while working two more than full time jobs) is definitely insane, we wouldn’t have it any other way. We got to visit lots of family over Christmas, both in Dallas and Denver. 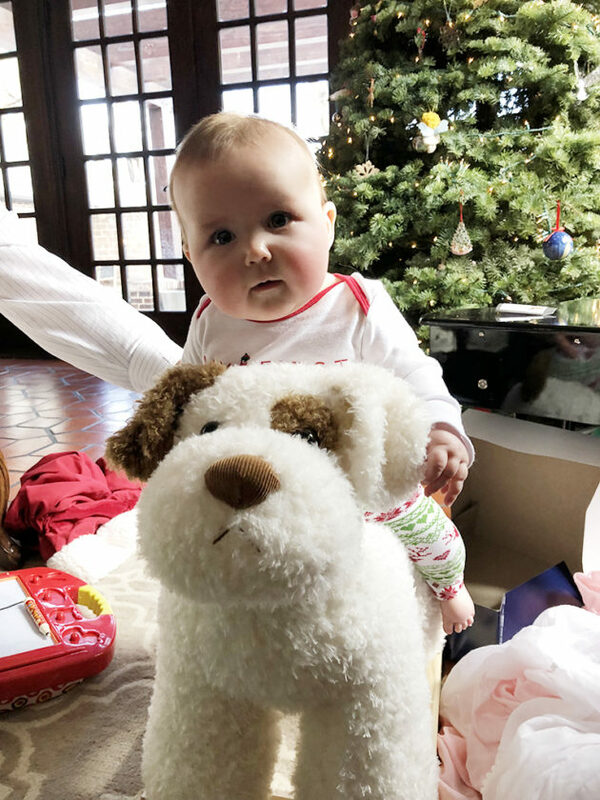 Emily got to meet her two living Great Grandparents and a whole lot of cousins, Great Aunts and Uncles and got to spend time with lots of Aunts and Uncles. It was a great holiday! 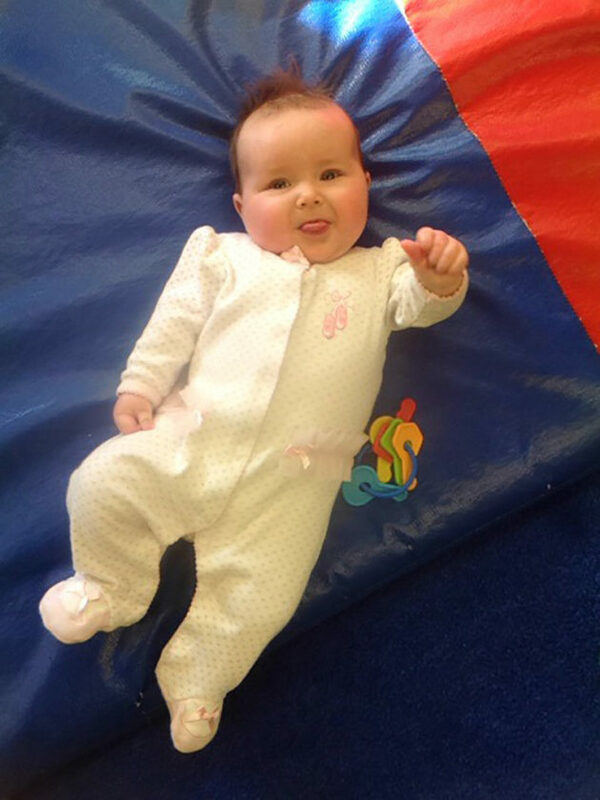 She spends a lot of time hanging on her mat, she has learned to roll over– both from front to back and back to front. She loves sucking her thumb and watching Lexie. 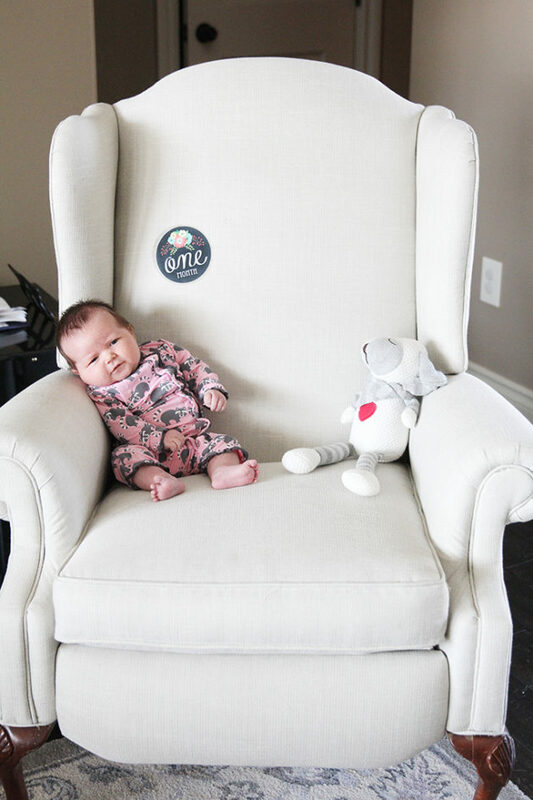 We are absolutely in love with this little Peanut (which earned her the nickname “Little P”). On August 8, 2017 we welcomed baby girl, Emily Grace to our little family! We couldn’t be more excited and happier for her to be here! 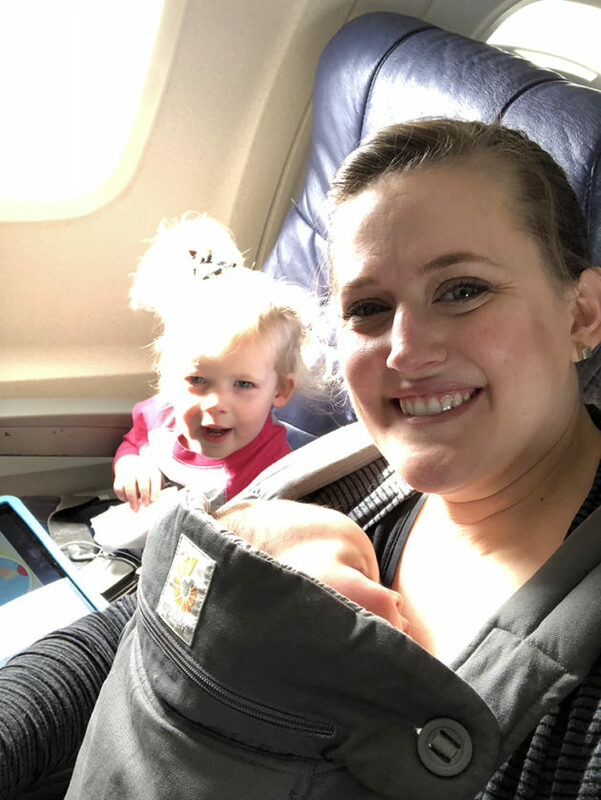 After a month things are starting to settle down and be in a bit of a routine (a crazy unsustainable sleepless routine–but that’s newborn life for you!). At 8 lbs 5 ounces, she was born with a full head of dark hair. We have spent this last month just recovering and resting (trying to) and getting to know Miss Emily Grace. She was born on a Tuesday, and by Thursday afternoon we checked out of the hospital and headed home. Although by Friday her bilirubin levels had gone up, so we spent the night with a bili-blanket. The next morning we went to check her levels and they had still gone up, so Miss Emily had to check back into the hospital to spend another day under the more intense bilirubin lights. 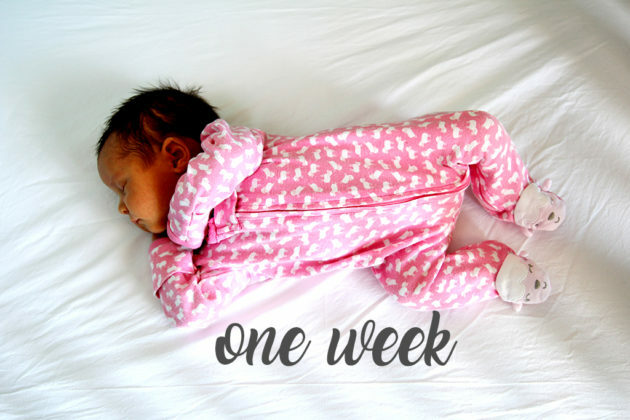 They originally told us it would be 2-4 days, but her levels ended up dropping so quickly that we only had to stay one (VERY LONG) day in ‘Special Nurseries’ which is an in between level for babies who need more care than the children’s wing, but less than NICU. We had AMAZING nurses there who were sweet and kind and patient. They have very hard jobs and we were so grateful for their hard work. We also feel extremely lucky to have only had a short stay there, as many of the other tiny kiddos have to spend significantly longer periods there, and since Wesley Hospital services most of western Kansas, there were a lot of families that were far from home, so we spent most of the day feeling fortunate for our circumstances, even as we were worried about Emily. 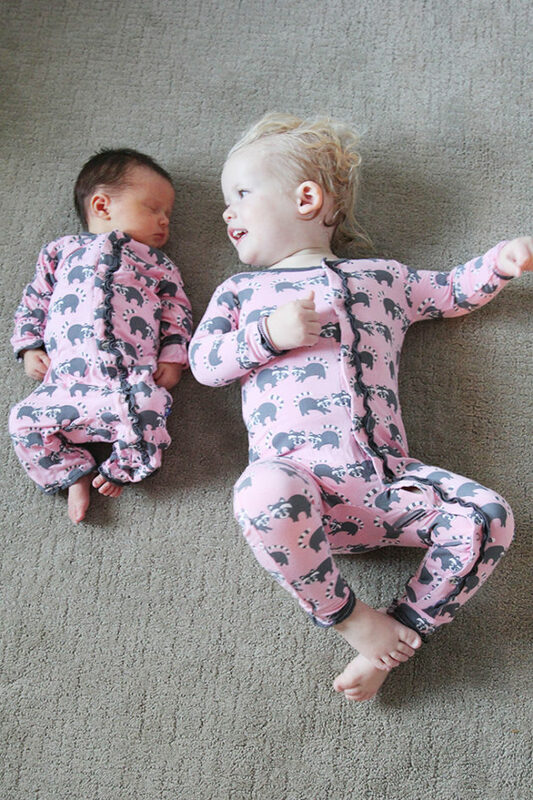 But since she came home, she has started to look MUCH less orange and we have full belief that she will end up with unbelievably pale skin, just like both Reese & I and of course, big sister Taylor. She sleeps a lot, loves to eat and hates getting a bath (although she always sleeps a long time after a bath, so mom and dad are big fans!). She likes being swaddled in a sleep sack, but hates pacifiers (much to big sister’s disappointment, as she cannot fathom why someone wouldn’t want a ‘wubba’). The one week that I went in to weigh her after being out of the hospital, she had gained 1lb and was eating on par with a 3-6 month old, so she is starting to get adorable fat rolls and a couple of chins, making her a cute little round baby, perfect for snuggling. She has given us a few brief periods of 4-5 hours of sleep, but most of the time she sleeps in 3 hour chunks. She also loves being held during the day, so I’m sure daycare will appreciate that in a month, but for now I’m enjoying the time at home with just her and me! But nights and mornings are filled with Big Sister and Dada time. And both are completely smitten with Emily. Taylor is obsessed- and has no sense of personal space! Emily is the first thing she asks about in the morning, and if Emily is not around she is always worried about where she is. She says Emily’s name in a high pitched voice that usually comes out sounding like “Em-e-weeeee”. And if Emily is spotted with her eyes open Taylor shouts “a-wake! 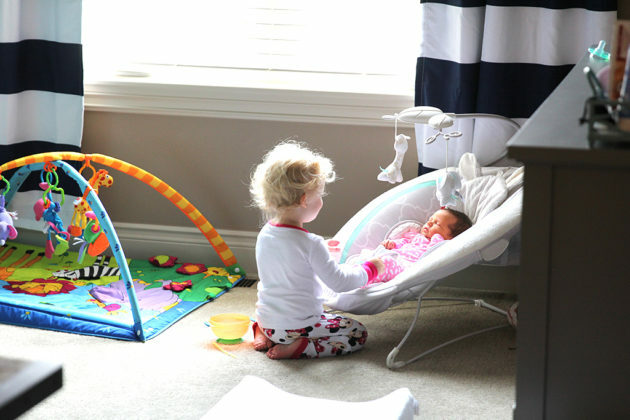 a-wake!” Its so fun to see Taylor loving on her little sister, even if it comes with a lot of prompting to BE GENTLE. 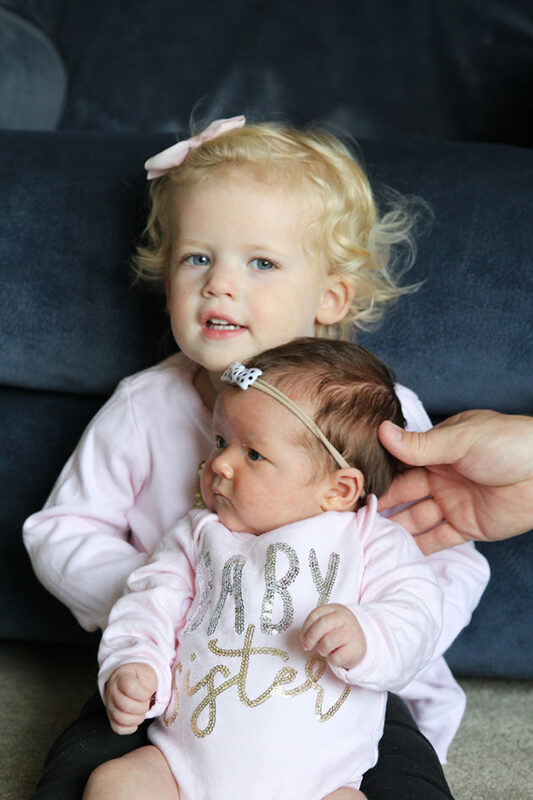 Taylor loves wearing matching outfits with little sister–which by the way is hard to do with a toddler and an infant- finding them is hard, and then someone is always spilling something! But when you come around the corner and you see this… it is all worth it. And I’m pretty sure that’s the only time in my life I’ll be able to grab my camera and snap that perfect of a picture at the right time. Timing. is. Everything. ps. if you want to read about what month one was like for Taylor: that post is here. Well everyone, tomorrow is the day that baby girl arrives! 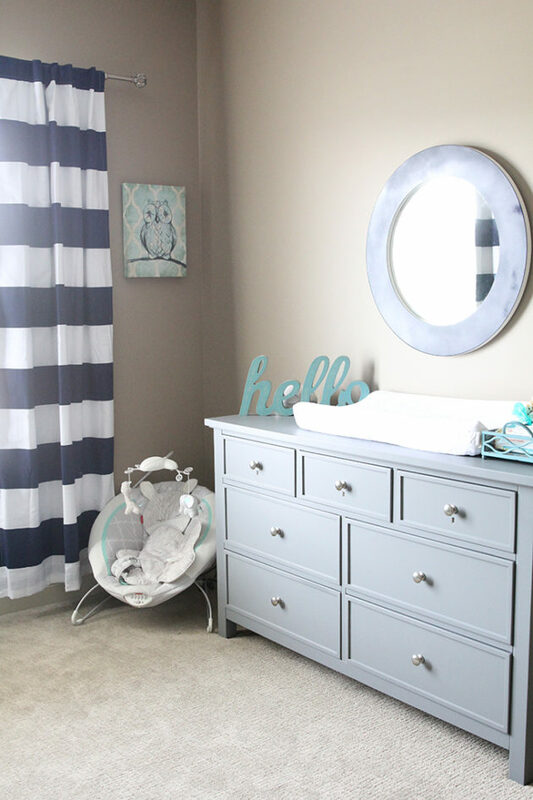 And I promised you all a nursery update, so here it is… you can spend your time reading this while you anxiously await her arrival… no, just me (and of course my family!) anxiously awaiting her arrival? I’m sure I’ll post a pic to the Facebook page sometime in the next few days, but for probably the next week (at least) I’ll be MIA, recovering from the c-section and soaking up every minute with a precious newborn. So in the meantime, enjoy the nursery! 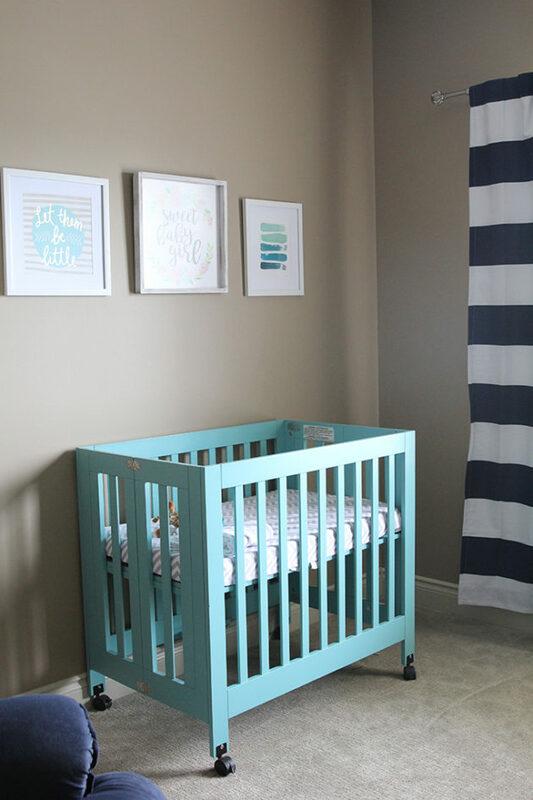 We decided to go with a turquoise-y teal/navy theme for this room. 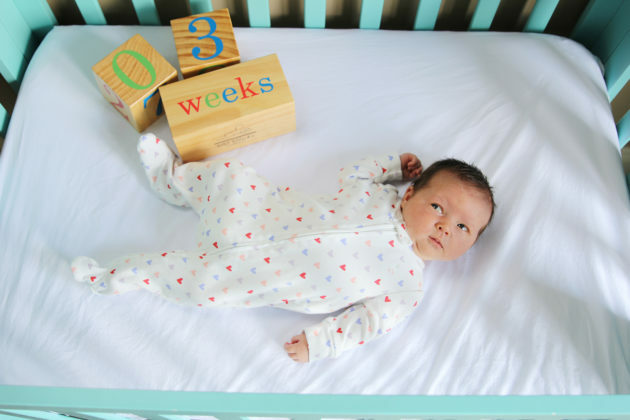 It mostly started when my mom found this super cute mini crib on clearance in a beautiful turquoise color. And from there, the rest of the room sort of evolved. 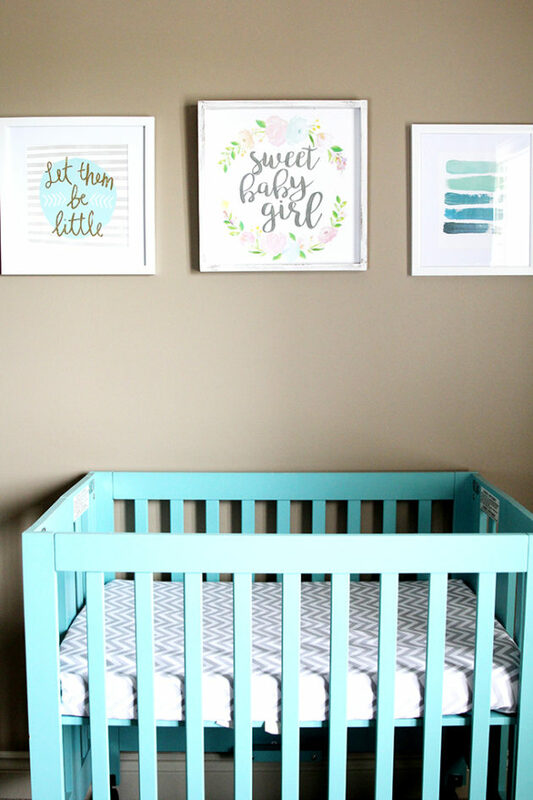 Hobby Lobby has a whole bunch of super cute artwork right now, so all three of these pictures above the crib were snagged from there, and a few of them even at 50% off! We decided to go with the mini crib because Taylor is still sleeping well in her crib and shhhhh… she doesn’t know she is perfectly capable of climbing out. And with so many other changes in her life, we aren’t wanting to throw too many other life changes at her. BUT, I think by the time new baby girl is too big for this crib, Taylor will have figured that out and will be in a big girl bed and we can move her crib into here. 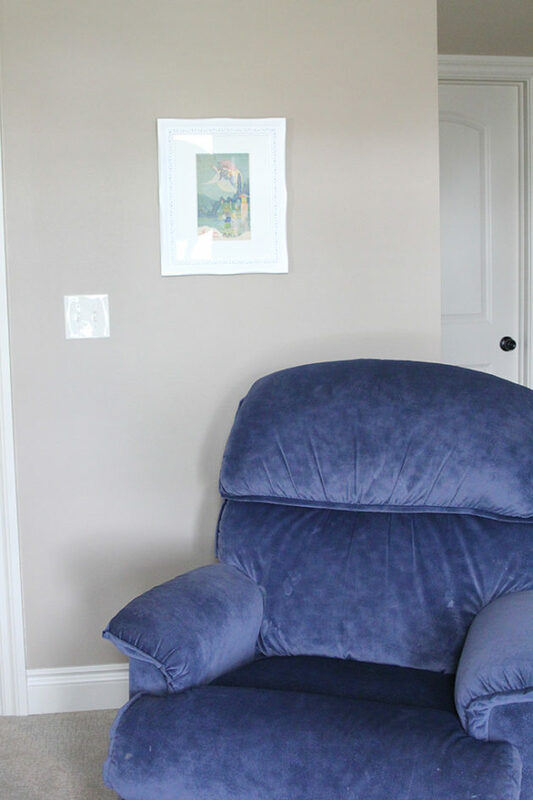 We debated whether or not to buy a fancy glider or rocker for her room, but finally decided that the OLD la-z-boy recliner in our basement would match, is CRAZY comfortable and since I would be spending a lot of hours in the middle of the night hanging out nursing here, we decided to go with comfort over beauty. And I’m pretty sure I’ll be happy with my decision in 6 months when baby girl is still waking up for 2am feedings. 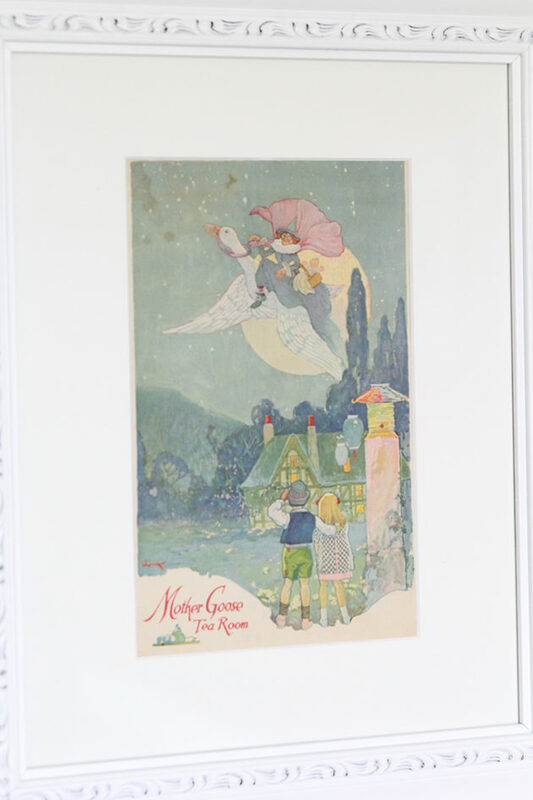 I’m still looking for a small table to put next to it, and maybe a lamp, but I love the little picture I framed above it. Its a menu from a tea room in St. Louis that my grandmother had saved, presumably because she thought the menu was so cute. I loved that it fit the colors of baby girl’s room, and brings in that touch of her that I would have missed without it. It still makes me sad that she won’t get to meet this baby girl, because she loved Taylor and getting to spend time with Taylor so much. 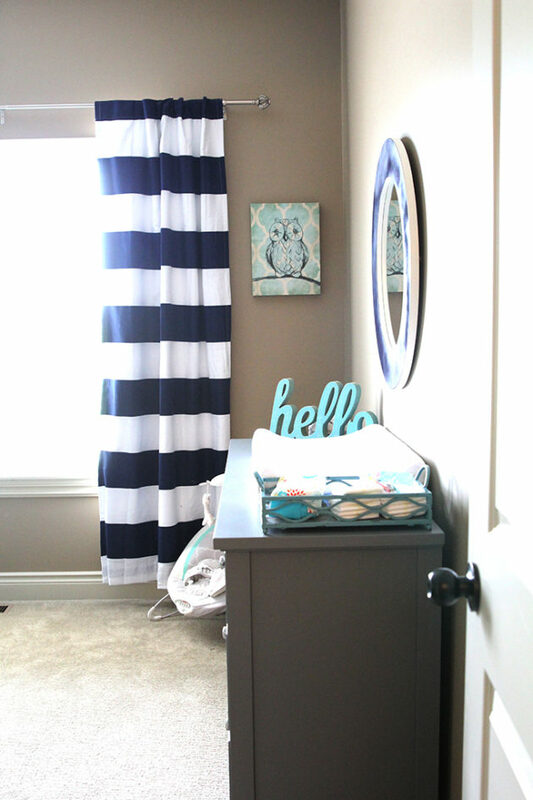 The blackout curtains were a Target find– I love the navy and white stripe and the pop of color it brings to that end of the room. 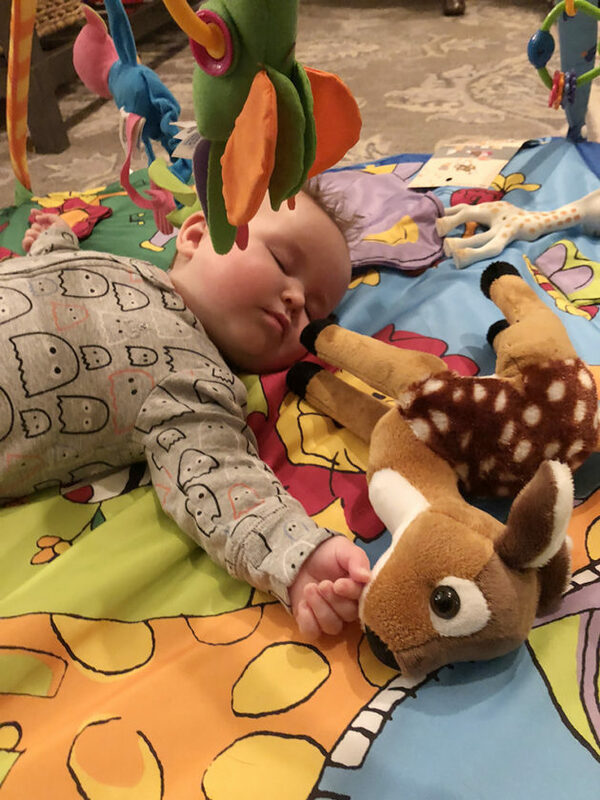 Especially since I know that they will almost never be opened like this… and I’ll have to live with closed off curtains most of the time, because lets face it, open windows are not conducive to infant sleep… and everybody loves a sleeping infant. The dresser was what we call an ‘investment’ piece. 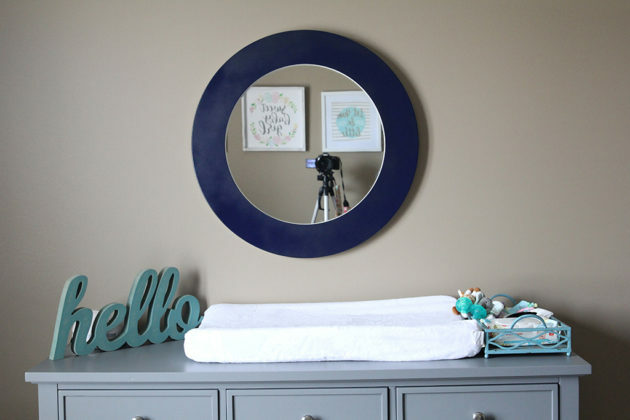 We decided to take the plunge and spend the money on a nicer dresser from Pottery Barn Kids. It is the Elliot Extra Wide in Charcoal if you were looking for something similar. We are pleased with the quality and size. It looks great in there! In Taylor’s nursery, I bought a hand me down dresser in Waco one weekend and repainted it when I wanted it white and not cream. Its a beautiful dresser, and I still LOVE the look of it, but some of the drawers are not very easy to open and close, and at least one of them is mostly beyond repair. So we decided for this room we wanted one that at least had functioning drawers. The mirror is an OLD Ikea mirror that we have had for YEEEEEARS- like maybe 12 or 13? My mom had the brilliant idea to paint the face of it Navy to match the room and I LOVE the way it turned out! She just taped around the edges and spray painted it Navy. It looks perfect above the gray dresser and really ties in all the pieces in the room. And that’s where baby girl will live for the foreseeable future! I’m sure as she gets older, the room will evolve a bit, but I love the way this turned out. I love that it is very different than Taylor’s first room was, and that she will have a space that is very much her own! Although I am sure that their shared Jack and Jill bathroom will be the source of many shenanigans over the years, I love that they will be connected there as well! Pray for us as this new phase of life begins!